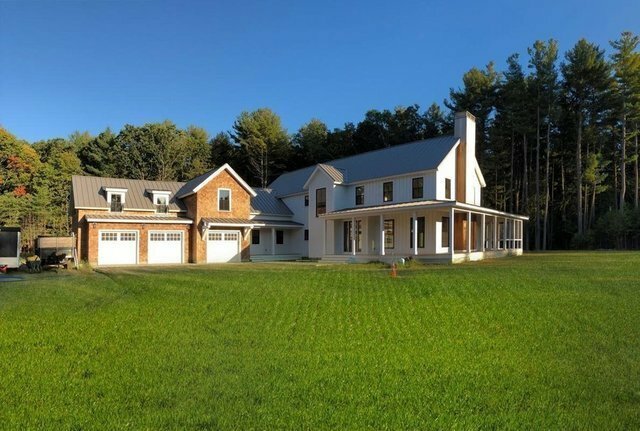 Exquisite new construction yesteryear farmhouse with all the traditional farmhouse charm and all the amenities of a brand new home on a beautiful one-acre flat, all useable lot.First floor features wonderful open floorplan with rustic white oak flooring throughout. Family and living rms offer gas fireplaces with gorgeous reclaimed mantels, as well as built-ins in the family rm with access to the lovely backyard. Dining rm features two sets of floor-to-ceiling cabinets and quartz serving counter.Don't miss the top-of-line kitchen with Sub-Zero and Wolf appliances, a wonderful center island, beverage center and custom walk-in pantry. The First floor also features a mudroom, laundry room and half bath, all with beautiful custom cabinetry.Head upstairs to your cathedral ceiling Master suite with two walk-in closets and double vanity en-suite bath. Second floor also features second en-suite bedroom, as well as two additional bedrooms and a full bath, plus a second laundry rm and large bonus rm above garage with full bath.